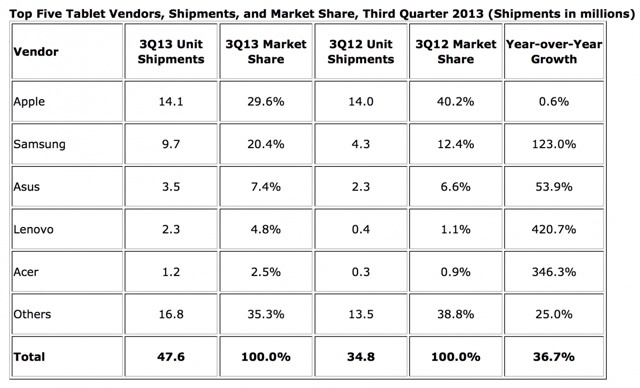 Apple's share of the worldwide table market fell below 30% last quarter as total tablet shipments grew to 47.6 million units in 3Q13, according to IDC. The market grew 7% over the previous quarter and 36.7% year-over-year. Samsung secured the second place position with shipments of about 9.7 million tablets and 20.4% of the worldwide market. ASUS shipped 3.5 million units during Q3 giving the company 7.4% market share.